This is something I have never wanted to admit, especially as a young marine scientist. It is something that I did not think was true. It is something that I never thought could happen to a person who has grown up riding roller coasters. I discovered this last friday when we went out on the boat in my deep sea and subtidal ecology class. 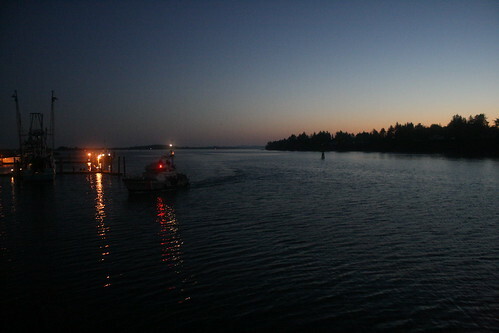 Instead of staying in the bay, we found ourselves passing through the mouth the jetty into the ocean. We were going out to deploy a go pro camera sled to look at the sand dollar beds right offshore, hoping to discover something about their distribution after discussing a study on sand dollar bed ecology earlier in class. I was excited to finally go out in the open ocean! Even though I grew up in the San Francisco bay area, my time spent on boats has been very minimal and mainly limited to paddle boats in the lake or kayaks during summer camp. As we made our way out of the bay, a few of us sat up front on the bow, enjoying the sunny day as the sea breeze whipped past. Upon arrival at the sand dollar beds, my friend looked over and warned, “This is when it’ll hit.” Little did I know what was coming next. We deployed the sled for 4 minutes, hauled it back up, and looked at the video with excitement. Of course, the go pro moved on its way down, so we did not see any sand dollar beds. When we started lowering it down again, I realized I did not feel good… At all. Trying to hold a conversation was about as difficult as an o. chem exam. I quickly shed all my layers and moved up to the bow. The entire rest of the trip I spent curled in a little ball, anxiously awaiting our return trip back home. Let’s just say when we got back, chili hot dogs for lunch did not sound a bit appetizing. 1. Teaching is really fun! We had the opportunity to take a visiting class of freshmen and sophomore biology majors to the mudflats and tide pools sunday morning. Even though I’ve only been taking invertebrate zoology for 2 weeks, I had fun sharing what I did know about the worms we dug up in the mud flats and all the amazing creatures we found tide pooling. My favorite moment was when one girl asked about “floating jelly balls” she saw at the dock the previous day. I was excited to tell her all about ctenophores, which we just learned about in class. 2. There is nothing like a long run with friends on the rim of sea cliffs to start a Saturday after a full, hardworking week. 3. Making tissue sections is a pretty relaxing way to spend a couple hours after studying all morning, especially when listening to my favorite podcast. I’ll write more about this project next :). 4. Worms are wondrous! We learned all about Platyhelminthes (flat worms) and Nemerteans (ribbon worms) in class today. I particularly like the flat worms; their little tentacles and eye spots are cute. We also placed Nereis (a polychaete) in a tub full of Paranemertes. In the mudflats, when Paranemertes comes across a mucous trail of Nereis, the chase is on! OnceParanemertes catches up, it attacks with its proboscis injecting paralytic toxins into the polychaete. It was amazing seeing these tiny nemerteans attack this giant polychaete with their proboscises. I’ll end with a wondorous picture of Emplectonema gracile, a beautiful green Nemertean. I put it under a compound microscope to be able to draw its internal structures (gut, brain, gonads, etc…). I saw all these giant cells next to the gut thinking they were normal cells (what constitutes a “normal cell” I’m not really sure…), but when I asked my professor he was surprised to see so many eggs! The adventure of work and learning continues! And one day, sea sickness will be conquered. It’s hard to believe Winter quarter is over, and I am back at OIMB after an eventful, yet relaxing spring break in California’s Bay Area. I enjoyed spending time with my parents, my best friend from back home, visiting my sister and her husband in their new house in Southern California, rock climbing with my older brother, and going to San Francisco with a few of my friends from Oregon. Now it’s back to work! This quarter I am taking Invertebrate Zoology and Deep Sea Ecology as well as a class in preparation for a 2 week trip to Panama in the summer (I’ve never been out of the country before!). I’ll also be working on my honors thesis. This will be a busy quarter, but I am looking forward to the work and learning. Tethya california. 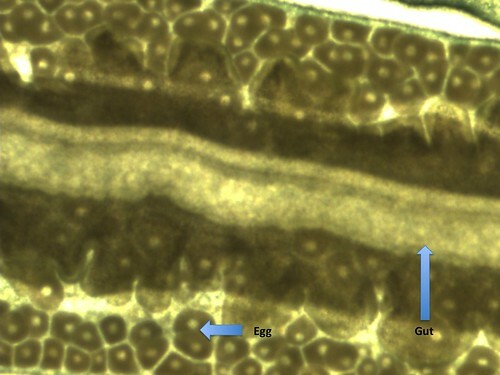 A cross section looks like an orange, with spicules radiating from the center. Tuesday was our first class of inverts, and we learned all about sponges. I’ve seen sponges before. I’ve touched sponges before. I thought I knew a bit about sponges. I also thought they were not very exciting…but I was wrong! Sponges are pretty cool little creatures, especially considering their sessile life. Essentially, two cell types are responsible for the circulation of water, capturing and digestion of food, excrement of waste/foreign particles, and capturing or dispersal of sperm/egg. It’s crazy that four processes that require four different organ systems in humans can be carried out by two cell types in a sponge! In the lab, we looked at sponges under microscopes, which we then had to draw in our lab books. Some people’s drawings are amazing! (and I’m not talking about my own…) Besides going out to the tide pool to look for sponges, my favorite part was looking at the spicules that form the skeleton of the sponge, especially the spicules of Leucilla nuttingi. Thursday in inverts was part 1 of Cnidaria: Anthozoa. After lecture we walked down to the docks to look for sea anemones as well as collect jellies for later on. We found so many cool organisms! There were a lot of lion’s man jellies (Cyanea capillita), which are rare to see in the boat basin, the shaggy rug nudibranch (Aeolidia papillosa), ctenophores, and of course sea anemones! While we were out, it was pouring rain with strong winds, making it for a wet, but fun adventure. To top it off, we came back to grilled cheese and tomato soup for lunch! I also learned that sea anemones are much easier to draw than sponges. The adventure of going out in stormy weather continued on friday in Deep Sea Ecology. After lunch, we went out in the bay for some otter trawls to study species richness. This was only my 4th time out on a boat and my first time doing this type of trawl, so it was really fun, even in sideways rain, choppy water, and crazy wind. We found a lot of cool organisms in the trawl, and since we just learned about sea anenomes the day before, we were able to identify Metridium senile to species! 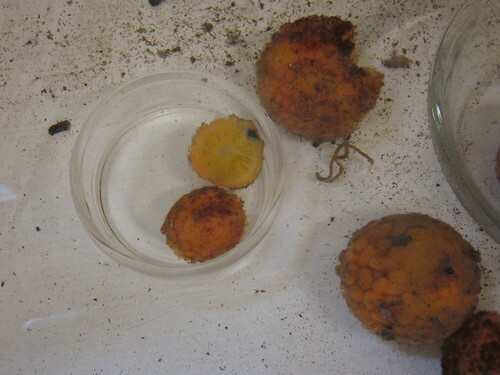 A tiny Pycnopodia (~4 cm in diameter) came up in one of the trawls. It was really cute, but right after we threw it back in the water, a gull came and ate it. That was a sad moment for all of us in our cruise. Apparently we can’t get enough of the rain because we went out tide pooling on Saturday, in our free time, in a down pour… If the rain keeps going as hard as it has this week, I will definitely get my money’s worth out of my rain pants. I sure hope that the sun pokes out sometime this week to say hello. Cyprids, Nauplii, and Copepods…Oh My! These past couple weeks have been busy in Eugene due to outings with my outdoor leadership class, vertical rescue class, an overnight backpacking trip on the coast, and a term paper for my animal behavior class. The quarter is slowly winding down, as I was reminded last week when I signed up for spring classes at OIMB! I am very excited to take invertebrate zoology (I hear we get to do many dissections!) and deep sea ecology. I can’t wait to be back in less than a month! At OIMB, classes are small and meet once or twice a week for the entire day. This allows plenty of time for hands on learning and actually doing science rather than simply reading and talking about it like most undergrad classes, which is why OIMB is such a great experience. My weeks during fall quarter started with Biological Oceanography on Mondays. Before this class, I was never particularly interested in the physical aspects of the ocean, but I soon discovered the fascinating relationship between the physical condition of the ocean and how it affects the biology. We learned all about the seasonal cycles of phytoplankton and zooplankton, currents, the thermocline, warm core rings, upwelling, the coriolus effect, and so much more. During one of our classes we were supposed to go out on the boat to collect plankton samples, but the ocean was too choppy. I was disappointed we were unable to go on the ocean because I have only been out on a boat in the ocean once before. 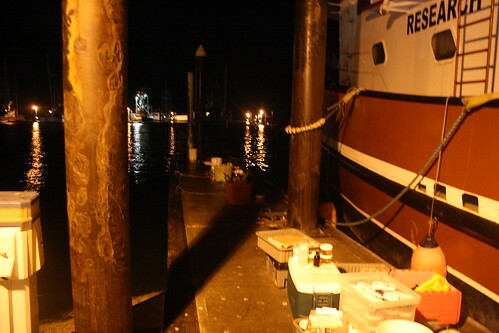 Instead, my classmates and I performed a 24-hour plankton survey off the Charleston Harbor docks. The goal was to note the variation in abundance of different plankton during various physical conditions (tide, time of day, vertical distribution). We were split into groups of two to cover a six hour shift from 10 AM on Saturday to 10 AM the following Sunday. We sampled every two hours by lowering a CTD through the column and collecting phytoplankton and zooplankton samples from the surface and at depth.I felt like a real scientist while lowering the CTD and dragging a plankton net through the water. Chris, my partner, and I collected samples on Sunday morning from 2 AM to 10 AM. Despite the fact that it was early and cold, it was exciting to collect our own data. The sunrise was also very rewarding! We spent all of lab analyzing our samples, which mainly involved counting plankton. This may not sound exciting, but it was so much fun! The first couple days were more difficult, as we were learning what all the different plankton looked like, but soon it was easy to tell them apart. The phytoplankton we counted were Coscinodiscus, diatmos, Navicula, Pseudonitzchia, Tintinids, and Distephanus. The zooplankton we counted were harpacticoid copepods, calonoid copepods, copepod nauplii, barnacle nauplii, barnacle cyprids, bivalves, polychaetes, zoea, and gastropods. My professor and TA’s enthusiasm quickly rubbed off on me as I realized how intricate, beautiful, and exciting plankton are. I always appreciated how excited my TA was when she saw a cyprid. I was always excited when I saw one cyprid in the midst of an overwhelming number of copepods. I have a fond liking for cyprids now and I think they are pretty cute :). The sun is about to come up! In total we had 52 samples to count between 8 people. It took most of the quarter to count all the samples and once we finished, it was time to research what the abundance of plankton meant. At first I was overwhelmed by all the data we had, but my professor suggested to focus on relationships that I found interesting. I decided to focus on the influence of the tides and time of day on the abundance of zooplankton, specifically cyprids, barnacle nauplii, harpacticoid and calanoid copepods, gastropods, and polychaetes. I found that the vertical distribution of zooplankton in the water column determines whether or not they enter, leave, or stay in the estuary. For example, harpacticoid copepods live in the brackish waters of estuaries, and during ebb tides, these copepods were more abundant at depth, possibly to avoid drifting out to the ocean with the tide. Due to my fondness for cyprids, I was particularly interested in learning more about them as well as their earlier stage, the nauplius. Barnacle nauplii are late stage planktonic larvae while cyrpids are the non-feeding stage of a barnacle that is ready to settle in the estuary. Both nauplii and cyprids came in with the flood tide, but only nauplii left with the ebb tide, suggesting that the cyprids settled into the estuary to grow into adult barnacles. This project was a lot of work, but it was also a lot of fun. I enjoyed collecting my own data and learning how to analyze the overwhelming amount. I was able to better understand all the relationships between the zooplankton and the water conditions because I collected this data rather than solely finding the information in a textbook our journal article. Learning from experience is the best (and most enjoyable) way to learn! 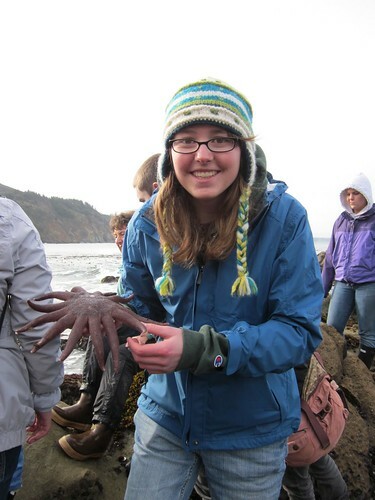 My name is Christy Stumbo and I am a junior undergraduate marine biology major at the University of Oregon who has a slight obsession with sharks and giant squid. I am from the San Francisco Bay Area, but have fallen in love with the great state to the north. Growing up, my family frequently went to Monterey to explore the tide pools and visit the aquarium. I believe these trips (and watching countless Jacques Cousteau documentaries on PBS) is where my fascination with the ocean began, and by 5th grade, I knew I wanted to be a marine biologist. I specifically chose to attend the University of Oregon because of the marine biology program at the Oregon Institute of Marine Biology (OIMB), and I spent my first term there in the fall of 2012. It was a great experience! I was a bit nervous at first because I did not know anyone. I was even scared that what I dreamed of doing my entire life might not be something I actually enjoyed, but I had nothing to fear. I enjoyed all my classes, the field and lab experience, and making new friends who share the same excitement for the ocean. During fall quarter, I took Biological Oceanography, Molecular Biology for Marine Sciences, and Marine Environmental Issues. Although my classes were so diverse, there was a lot of overlap between all three. I am currently in Eugene taking classes on the main campus, but I am anxiously awaiting my return to OIMB for the spring and summer. I am looking forward to being back, learning more about the ocean, working on my project, and surrounding myself with all things related to marine biology. Until then, I will share about my classes and experience during fall term as well as anything marine related that happens in Eugene.